Okay for those of you living in San Mateo County, major changes are being implemented by SamTrans starting 11 Aug 2013. 1. Routes 390/391 are discontinued and replaced by the ECR. The ECR will run between Palo Alto and Daly City BART. Service to San Francisco, South San Francisco and San Bruno BART stations are discontinued. The ECR will now run approximately every 15 minutes weekdays and 20 minutes weekends. 2. Many school trips are being moved to new routes, but not all. Route 140 is dropping the Terra Nova High runs, which are being moved to route 49. Remember if you are going to Tanforan and used to get there via the 391 into San Bruno BART, you will have to get off on El Camino & Sneath stop and walk over. You could get off at El Camino & San Bruno Ave and catch the 140 to BART, but you might have a long wait as the bus runs hourly between 9 a.m. and 2 p.m. weekdays. It runs hourly on weekends all day. You can also take BART to San Bruno and exit on the west side which is right in back of Tanforan. 1. Service to Parkside Intermediate is not dropped and will continue on the 140. Service to Terra Nova in Pacifica is being moved to new route 49. 2. Route 141 will be altered on 26 Jan 2014. According to SamTrans summary of 26 Jan 2014 changes: “Realign route via San Bruno Avenue to improve direct service to San Bruno BART; only serve San Mateo Avenue on select trips.” Both the 140/141 will serve the new Caltrain station at San Bruno Ave.
1. Routes 390/391 weekday service service eliminated and replaced by route ECR. Weekday ECR will run every 15 minutes between Palo Alto and Daly City BART stations. Service to San Bruno and South San Francisco BART stations discontinued. 2. Another change to Route 140 (Pacifica to San Bruno BART). The twice daily school bus trips are being discontinued and new Route 49 will do this service. 1. Route 140 will be extended to SF Airport Airtran. 2. Express route KX will operate between Redwood City and San Bruno BART including an SFO airport. Peak hour service to San Francisco Transbay Terminal. As noted in a previous post, the new ECR drops San Bruno BART dropping direct service to Tanforan and BART. People taking SamTrans have two choices taking the bus to Tanforan. Option 1: Take ECR to bus stop at Sneath & El Camino Ave(north and south) and walk to Tanforan. Option 2: Get off at San Bruno Ave & El Camino(north and south) and catch an eastbound 140 to San Bruno BART. BART is the easiest option. Simply take BART to San Bruno and you are right behind Tanforan. Downside: costs more than SamTrans. There is also in 2014 another option of taking the KX. This mixed route is being shortened from its present start in Stanford to Redwood City. This shortened route will run between Redwood City and San Bruno BART during offpeak hours and into San Francisco during peak hours weekdays. A stop at San Francisco International is part of this route. Weekend service will operate hourly. Note: This route does not duplicate ECR and only stops at selected stops. The 140 change is a surprise and threads a tough needle. 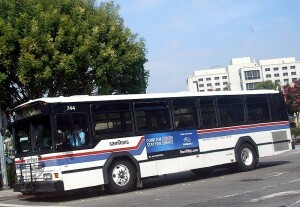 SamTrans states it is forbidden by federal law from providing dedicated bus service to schools. That is why bus routes such as 140 divert over at certain times during the school year to serve schools like Parkside Intermediate. Now they are discontinuing such service and shifting the service over to a new route (49) in August. Presumably this limited run meets federal regulations by making all regular and school stops when it runs. One possible reason for this change is that commuters who boarded the school trip buses found it added extra time getting to BART or catching an ECR. As noted previously SamTrans is making major changes to its schedule to cut costs and create efficiency. They did a review of all existing lines and put forth a proposal based on these findings. It is the first major system-wide change in a decade. Routes 140 and 141 which serve San Bruno faced some major changes. The final proposal has been adopted and surprisingly both routes saw major revisions to the proposed changes. The proposed change was to drop the Allen crossover between College and Longview, dropping the Bayhill, San Bruno Ave, and Huntington sections in favor of a going straight to San Bruno BART (SBB) down Sneath after Rollingwood. That has all been dropped and the route remains as it is now except for a proposed extension to San Francisco International Airport (SFO) AirTrain Station (pending coordination with airport). Comment: This was a surprise. it seemed certain months ago the proposals would go through. I opposed dropping the Bayhill and San Bruno sections since people who go to Bayhill would be forced to take two buses. Also having it use San Bruno Ave meant it could stop right near the new Caltrain station. What changed? They must have gotten some really strong feedback on this and possibly from the City Council. The extension to SFO AirTrain is in response to those who work at SFO and take SamTrans and BART. BART costs a lot more because of the surcharge placed on your ticket when exiting the station. So probably many who take SamTrans to BART wanted a less costly alternative. Going to SFO AirTrain would make it less expensive for workers. They would only pay the fare for SamTrans and not have to buy a BART ticket. The proposed change was to drop service on most of Jenevein, no longer serve San Mateo Ave (downtown San Bruno), and Third Street. The route would shift over to San Bruno Ave where it would go to Crystal Springs, down Jenevein to Cherry, Cherry to San Bruno and then back to SBB. The revision drops that. Instead the 141 will continue using Jenevein but go down San Mateo Ave to SBB instead of turning at Angus to Third Street. The new Caltrain station will be served by this route as well. School trips will be the only times it crosses over to Third Street. Comment: Again this was a surprise. Perhaps more people on Jenevein wanted the service than thought. Actually the thought of having this route go directly to SBB via San Mateo Avenue is something others have said before. It made no sense to go over to Third Street and back down San Bruno Ave to turn back on Huntington. The new way makes it more efficient, serves downtown San Bruno, Caltrain, and BART. Unfortunately the proposal on this one remains. Currently the 391 pulls into SBB but under the new schedule, the ECR will not serve this station. Instead passengers will embark/disembark at stops near Sneath & El Camino and walk to Tanforan. It is not a long walk but certainly not as convenient as it is right now. SBB is right behind Tanforan and provides easier access. For those wanting to go to SBB using ECR, they would have to transfer either to the 140 or 141 or walk from El Camino Real. When the new Caltrain station comes on line, they could get off at the San Bruno station and catch either a 140 or 141 to Tanforan. SamTrans wants to remind that these changes are also subject to revision down the road if things change (less passengers etc). SBB is losing the 391 and 133 leaving only the 140, 141 and shuttles serving it. The good news is that routes 140, 141 changes are not drastic and made better. It is unfortunate that the ECR will not serve SBB but not entirely unexpected either. Most people who take the 391 to SBB usually go to Tanforan or catch another bus (like the 140) rather than BART. For people wanting to head north/south on ECR, they now have to do so near Sneath & El Camino. As a side note, SBB bus area is not a nice area. It has all the charm of an underpass, is often dirty with spilled food and other items, and some shady people hang about as well. Though San Bruno Police has its headquarters in the plaza, and BART police also is around, you rarely see any foot patrols in the plaza or bus area. How difficult is it for someone to do a walkthrough a couple times a day?